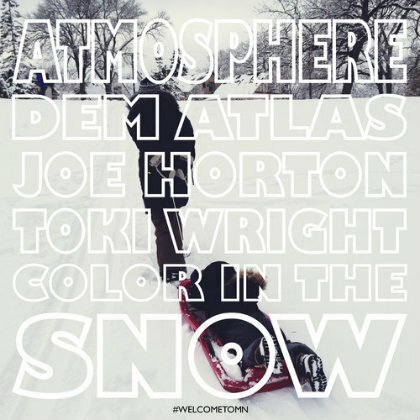 Maybe in promotion of their upcoming album, maybe in promotion of their fourth annual "Welcome to Minnesota Tour", or maybe just out of the goodness of their hearts, Minnesota hip-hop duo Atmosphere have just released a winter-themed single, "Color In The Snow," that's available as a free download. The track is a classic Atmosphere production: Slug laying down his storytelling lyricism over a tight cyclical keyboard progression. Hellz Yea @atmosphere Album DONE! To snag this free download and check out some other Rhymesayer / Atmosphere tracks, head over to their official SoundCloud page.